Spring Rainbow From Willow Creek Alaska on a Fly Rod! Matt Mackay of Fort Richardson shows off a picture perfect rainbow trout taken on May 5th from the mouth of Willow Creek. The fish was approximately 20 inches and taken on a 5 weight fly rod and a Cotton Candy fly pattern. 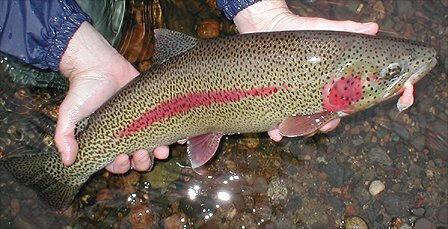 These big spring rainbows begin moving from the mainstem of the Susitna River into the clearwater tributaries in early spring to spawn. Once spawning is complete they frequently will reposition themselves near the mouth of the tributary and gorge themselves on outmigrating salmon smolt and emerging alevins.